2. Mr. Terronez not only performed in an exceptional manner, but he demonstrated an exceptional devotion to duty. He was available around the clock to accept reports from those assigned to this project or to personally resolve conflicts that might otherwise have resulted in serious confrontations. He was always available to travel without advance notice and he spent many days and nights, including numerous weekends, away from his family. Many public officials expressed their appreciation to the Community Relations Service for Mr. Terronez' sound counsel and skillful handling of sensitive problems. His commitment to the task met the highest standards of the Community Relations Service and the Department of Justice. The credibility of the Federal Government was enhanced among state and local officials and citizens as a result of Mr. Terronez' work. Exceptional performance is not new for John Terronez, In 1972, less than two years after he joined CRS. Mr Terronez received the highest regional honor in the U.S. Government when the Chicago Federal Executive Board named him Employee of the Year for his work with the Hispanic community in that city. The following year, he received a Special Commendation Award for the Attorney General for his excellent work as part of the CRS team assigned to help prevent violence, during the occupation of Wounded Knee. 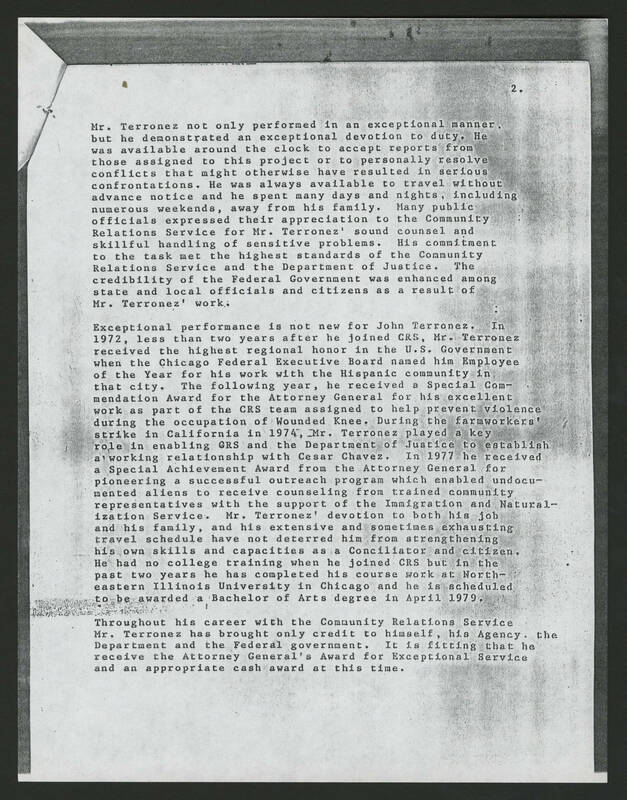 During the famworkers' strike in California in 1974, Mr. Terronez played a key role in enabling the CRS and the Department of Justice to establish a working relationship with Cesar Chavez. In 1977 he received a Special Achievement Award from the Attorney General for pioneering a successful outreach program which enabled undocumented aliens to receive counseling from trained community representatives with the support of the Immigration and Naturalization Service. Mr. Terronez' devotion to both his job and his family, and his extensive and sometimes exhausting travel schedule have not deterred him from strengthening his own skills and capacities as a Conciliator and citizen. He had no college training when he joined CRS but in the past two years he has completed his course work at North eastern Illinois University in Chicago and he is scheduled to be awarded a Bachelor of Arts degree in April 1979. Throughout his career with the Community Relations Service Mr. Terronez has brought only credit to himself, his agency, the Department and the Federal government. It is fitting that he receive the Attorney General's Award for Exceptional Service and an appropriate cash award at this time.